An optical fiber is a transparent and flexible fiber made by drawing glass or plastic, which is used to transmit light. The optical fiber has wide usages in fiber-optic communications, where they allow transmission over longer distances and at higher bandwidths than wire cables. The adoption of fiber optic cables to send signals with less amount of loss has increased over the period, which drives the growth of the market. 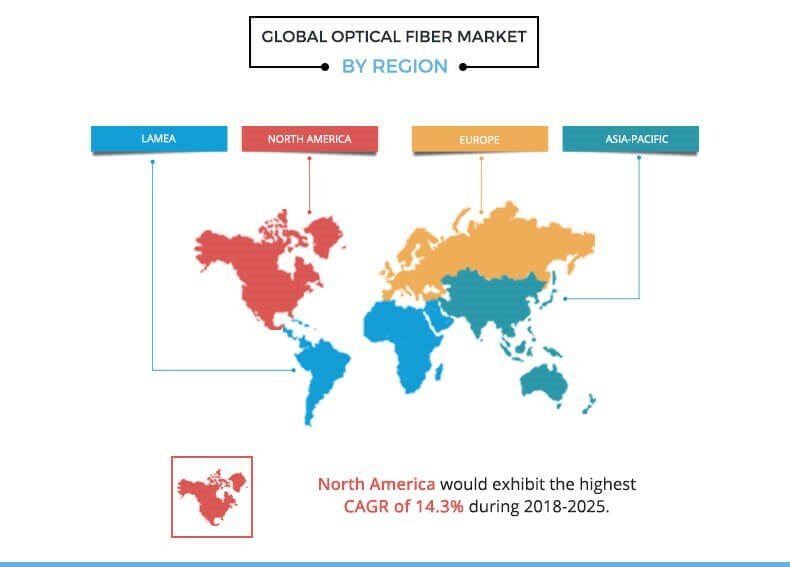 The global optical fiber market was valued at $3,477 million in 2017, and is projected to reach $8,153 million by 2025, growing at a CAGR of 11.6% from 2018 to 2025. The single mode segment dominated the overall market in 2017 and is expected to continue this trend during the forecast period, as it offers numerous advantages that include high attenuation and dispersion, great data-transmitting capabilities, and others. The telecom & IT segment dominated the overall market in 2017 and is expected to continue this trend during the forecast period owing to the growth in need for greater bandwidth and faster speed connections. 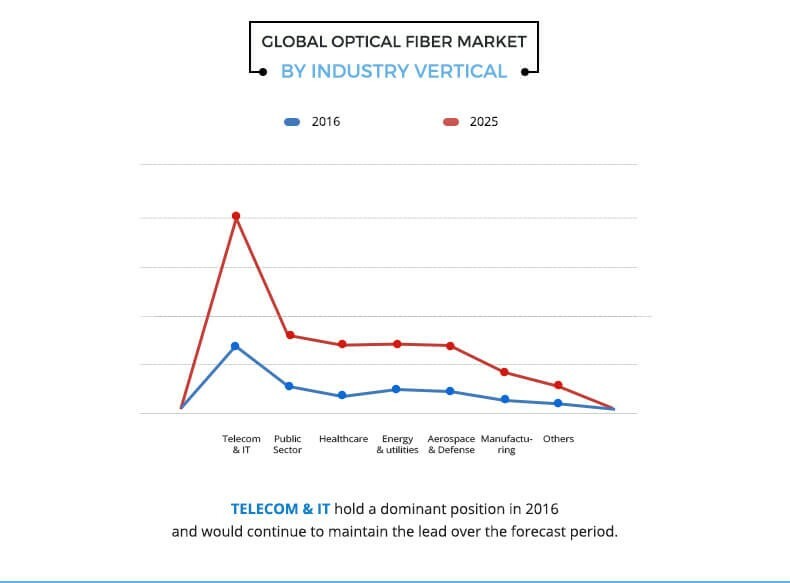 These factors have increased the demand for optical fiber cable and connectors in the telecom sector. The Asia-Pacific region dominated the overall market in 2017 primarily due to increase in penetration of optical fiber technologies in developing economies owing to numerous upcoming projects, such as smart cities. However, North America is expected to witness the highest growth rate during the forecast period. The report focuses on the growth prospects and restraints of the market based on the analysis of the global optical fiber market trends. The study provides Porter’s five forces analysis of the industry to understand the impact of various factors such as bargaining power of suppliers, competitive intensity of competitors, threat of new entrants, threat of substitutes, and bargaining power of buyers on the growth of the market. The global optical fiber market is segmented by mode, type, industry vertical, and region. Based on mode, the market is bifurcated into single mode and multi-mode. By type, it comprises glass optical fiber and plastic optical fiber. Based on industry vertical, it is categorized into telecom & IT, public sector, healthcare, energy & utilities, aerospace & defense, manufacturing, and others. Based on region, it is studied across North America, Europe, Asia-Pacific, and LAMEA. Widespread implementation of 5G, increase in adoption of fiber to the home (FTTH) connectivity, and emergence of internet of things (IoT) act as major drivers of the market. However, high installation cost & growth in the wireless communication systems are expected to hamper the global optical fiber market growth during the forecast period. Furthermore, technological advancements in the fiber optic cable technology and rise in investments in optical fiber cable (OFC) network infrastructure are expected to provide lucrative opportunities for the market. The demand for more data and better coverage across the world is on the rise among consumers. The 5th generation wireless connection is expected to be the next leap in technology, as it can transmit more data while providing a more steady and reliable connection. The characteristics of 5G, such as high data speeds and throughputs, are greatly influenced by these heavy-duty optical fiber networks that affect both the wireless side and wireline side of the infrastructure. Moreover, formidable network performance goals of 5G are heavily predicated on a massive availability of fiber connectivity. 5G is currently being tested in several markets and is expected to begin widespread implementation in 2020. FTTH is a popular integrated communication technology that uses fiber optic technology to enable faster and more effective communication. The technology connects homes to the operator through optic fiber wires. It is the most advanced technology for building the next generation of communication networks. For instance, fiber connections are used by more than 130 million homes. Also, China was expected to have almost 100 million fiber subscribers in 2015. Moreover, European countries, such as Norway, Lithuania, Denmark, Sweden, and Latvia, have been approaching near universal access to fiber. The growth of 5G is expected to be fueled by the hike in consumer data and the explosion of internet of things (IoT) devices. According to the International Telecommunications Union (ITU), the market for IoT devices is estimated to generate over $1.7 trillion by 2019. Also, owing to these developments, investments on fiber infrastructure are expected to surpass $144.2 billion during 2014&dash;2019. Moreover, numerous countries have invested in optical fiber deployments, which is creating opportunities for the market. For instance, the U.S. needs significantly more fiber-optic infrastructure over the next five to seven years to support upcoming 5G wireless as well as broadband competition and rural broadband coverage that is expected to deploy fiber cable of around $130 billion to $150 billion. 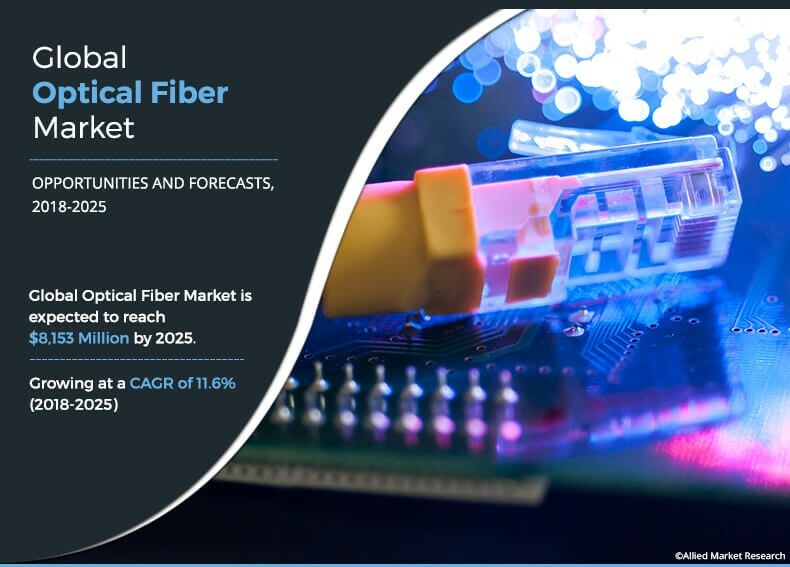 This study includes the analytical depiction of the global optical fiber market along with current trends and future estimations to determine the imminent investment pockets. Porter’s five forces analysis illustrates the potency of buyers & suppliers in the global optical fiber industry. Rise in adoption of optical fiber in end-use applications such as CATV, telecom, sensors, premises, and others, are driving the growth of the optical fiber market. Along with these, copper wires in the communication sector are being replaced by optical fibers owing to their numerous advantages associated with electrical transmission such as high security, high bandwidth, resistance to electromagnetic interference, and transmission of long-range signals. Moreover, in the upcoming years silicon-based optic fibers are expected to be replaced by polymer optical fibers that offer cost-efficient and easy processing of optical signals. This is expected to boost the growth of the optical fiber market during the forecast period. Furthermore, ongoing R&D for developing polymer or plastic optical fibers as transmission media for an aircraft is expected to provide numerous opportunities for the market. Along with this, growth in demand for internet applications such the Internet of Things (IoT), cloud computing, data storage, data transfer, video streaming, and over-the-top content are also driving the market. The global optical fiber market is highly competitive owing to strong presence of the existing vendors. Optical fiber vendors who have access to extensive technical and financial resources are anticipated to gain a competitive edge over their rivals, as they have the capacity to cater to the global market requirements. The competitive environment in this market is expected to further intensify with increase in technological innovations, product extensions, new product launches and different growth strategies adopted by the key vendors. Some of the key players profiled in the report include Fujikura Ltd., Corning Incorporated, Sterlite Technologies Ltd., Furukawa Electric Co., Ltd., The Prysmian Group, Finisar Corporation, Sumitomo Electric Industries, Ltd., Nexans S.A., Reflex Photonics, Inc., and Tata Communications Ltd. in its outer diameter and weight. Also, in March 2018,reductionThese players have adopted various strategies to enhance their product offerings and increase their market penetration. For instance, in November 2017, Fujikura Ltd. launched the world's highest density optical fiber ribbon cable, 3456 fiber wrapping tube cable (WTC), which allows 12 fiber mass fusion splicing owing to its flexible spider web-like structure with Corning Inc. launched its latest optical fiber cable innovation RocketRibbon, an extreme density cable, which allows up to 30% quicker installation than other high-density ribbon cables designed for data center and carrier environments.